It is common for people to change their mind and decide they no longer want a tattoo. In recent years technology has enabled tattoo removal to become an option using lasers. Laser Tattoo Removal: How It works. It order to explain how laser tattoo removal works you first need to understand how the tattoo itself is formed. Inks are injected deep into the skin, and the blobs form a pattern or design. These individual ink blobs subsequently are encapsulated by the body’s own defence system making them inactive and ‘permanent’. Though there are other methods of tattoo removal, such as creams and surgery, laser tattoo removal is regarded as one of the safest and most effective methods for removing unwanted ink. Laser tattoo removal works by a laser penetrating the deep layers of the skin with an intense light. Energy pulses from the laser are fired in fractions-of-a-second into the skin, targeting the ink blobs found in the deep layers. This process breaks up the ink particles, which are then passed through the body, leading to the tattoo fading. 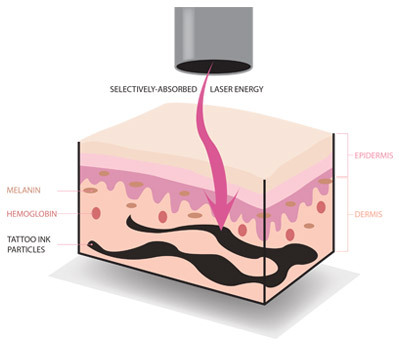 When the procedure is performed by a qualified practitioner, such as those at Skin Medical, the laser energy is harmless, as it only targets the skin that contains the ink pigments, which are then removed by the body’s own immune system. Similar to IPL laser treatment, the Active Q-Switch Nd Yag laser uses short bursts of light energy. The diagram shows how laser energy targets ink using a type of shockwave in an order to burst and disperse each ink bubble or blob. Each treatment is repeated after intervals of around 5-7 weeks causing the tattoo to gradually fade. Different colour inks will fade at varying rates and it is for this reason we use different laser wavelengths to optimise the fading where possible.